What is the purpose of Dinner for 8? 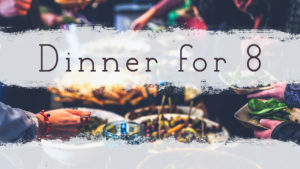 Dinner for 8 is a designed to build relationships within the church. Having meaningful Christian relationships is one of the keys to our spiritual health. The Lord has adopted us into the family of God. We need to get to know our brothers and sisters in Christ that we will be spending eternity with in heaven. This only happens by spending time together. In a normal church service, we rightly spend our time on worship of God through song, giving, and Bible study. This does not leave much time for building our relationships with each other through fellowship. How does Dinner for 8 work? It starts with gathering together in small groups to share a meal together. Groups plan their own meals and get together at least 4 times over a period of 4 months, sharing meals at participants’ homes in a potluck style, or at local restaurants. In this setting, we have a small group leader that directs the fellowship time to help everyone to get to know each other. You will be assigned to a group at the beginning of each period. Groups are designed to be diverse in age and gender and can be a mixture of couples and singles. What are the benefits of Dinner for 8? The relationships that are built through small group interaction can lead to opportunities for spiritual growth. As the Holy Spirit leads us, we get involved in other people’s lives. We can pray for one another and encourage one another in our Christian walk. Through directed fellowship, we can promote accountability and church involvement. What is the format of Dinner for 8? The emphasis is spending time together in fellowship. The small group leader will host the first gathering and notify the individuals in what dish to bring. Their goal is to help people feel welcome by having a loving atmosphere. Once everyone arrives, the leader will open in prayer, have an ice breaker, and start the meal. Following the meal, the group can read a Psalm, Proverb or short favorite passage (this is not a Bible study). Then spend some time in a group activity, and hang out. Then before leaving, write down prayer requests and distribute the cards to each other. The next dinner location and date will be decided prior to closing. If people need counseling, set up an appointment outside of the Dinner for 8 time. Ice breaker ideas and group activity ideas will be made available.